I have a closet full of all types of fabric. This book would give me plenty of projects to hopefully reduce my "inventory" which would also make my husband very happy! 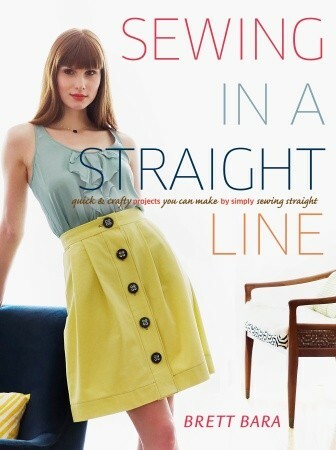 I'd love to have this book as I am trying to get back to regular sewing (having been totally hooked by quilting for some years). Love sewing, quilting, craft books. The lovely skirt with the big buttons on the cover is definitely my kind of sewing. This would be perfect for the Homemaker's group I am teaching sewing projects. They are just getting back into sewing. Would love the chance to win this book. Thanks! I love having a book of projects to use as inspiration for gifts. Even better is if I find a project I want to make as soon as I see it! I have lost over 40 lbs and need some inspiration for some new clothes for my smaller body. Also, our house needs some sprucing up as well! Thanks for the give away! I have been looking for a book to help my daughter learn to sew and this books sounds like the perfect fit, would love to win it so I can give it to my daughter for her birthday and we can read it together and help get her started on a lifetime of sewing. Any thing from Arrow is a gift to have. This book sounds wonderful! I'm a fairly new sewer, started with quilts. I want to learn to sew clothes, though, because a comfortable fit is so hard to find! Wonderful way to use all those scraps of fabric. I love sewing, just finsihed my first big quilt. I'm ready to start another one. I really would love this book. Thanks Marie. Nookity nook sewing book! I'd love to win!